We received an inquiry via a referral at the end of April 2014. Tara had seen our work via a friend who’s wedding we filmed. 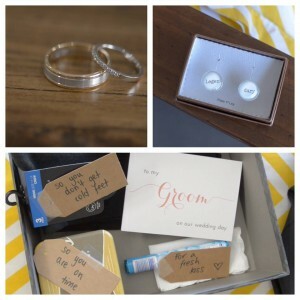 However, at the time, Tara’s budget would prevent Hitched Productions from filming her and Andrew’s wedding ‘unless’ as Tara described ‘they won the lotto’. We made a couple of suggestions for other companies that were more local and might be able to assist. Two months go by and we are now in late July. An email comes through from Tara stating that they really want a wedding film and the ‘others’ that they had looked at were no where near as good as Hitched Productions style and quality. 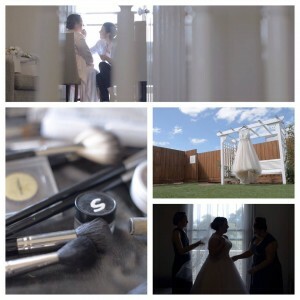 Three days later their wedding was booked and we would be heading to Bairnsdale in March 2015. For the record, Tara and Andrew had not won the lotto and they will both attest that one of the best decisions that they made in relation to their wedding day was booking Hitched Productions. 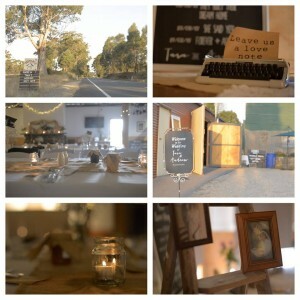 Without Hitched Productions, not only would they not have had a wedding video…..but who would have tied all those ties? Their feature film is below along with some screen captures! Above: Matt (me) tying one of the many ties at Tara + Andrew’s house. 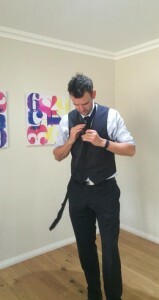 Wedding films are my hobby…..tying ties is my true passion. Hahaha.